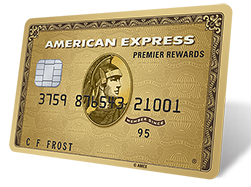 Last year, I applied for an American Express Premier Rewards Gold card for the 50,000 Membership Rewards sign up bonus. You can read more information on how to apply for your own Premier Rewards Gold card with a 50,000 point sign up bonus here on Slickdeals. The charge card offers a yearly $100 Airline Fee Credit for airline fees charged by the airline you select for your card. You need to select an airline by clicking here; you can select a different airline every calendar year. Different airlines you can choose include: Alaska, American, US Airways, Delta, Frontier, Hawaiian, Jet Blue, Spirit, United, Southwest and AirTran. Last year, I received the $100 statement credit by purchasing a $100 Southwest Airlines gift card. You can purchase Southwest gift cards here. While your airline fee credit can be used for various incidental airline fees like checked bags and in flight food and beverages, many charge card holders prefer to just buy an airline gift card and be done with it. That’s what I did last year and what I did again this year. 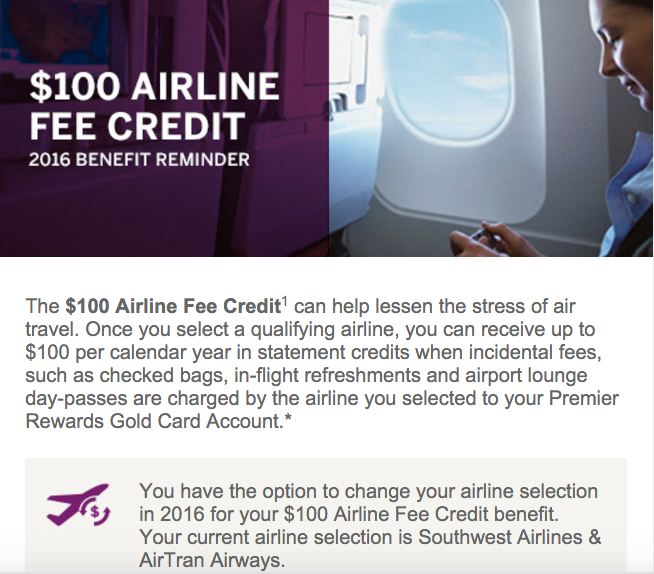 On January 3rd, I bought a $100 Southwest Airlines gift card. By January 5th, I received a $100 statement credit from American Express. With a 50,000 point sign up bonus and two $100 Southwest Airlines gift cards, the Premier Rewards Gold charge card has one of the most lucrative sign ups.